In addition, Weave Calculator can save and reload the calculations for a project. You can start sketching out a project while waiting for a bus, save your work when the bus arrives, start sketching out a second project over your lunch hour, save that, and on your next free day, go to the yarn store, reload one project, get the needed yarn, reload a second project, find yarn for it, take your purchases home, and whip our your phone and reload again when you are ready to measure your warp. Note: The images in this document were captured on a phone set to the blue theme. Where you see blue in the document, on your phone you will see your theme's accent color. 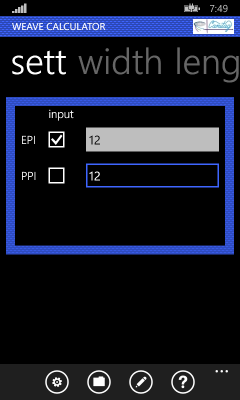 Weave Calculator 1.1 is a free application. It does not display ads. 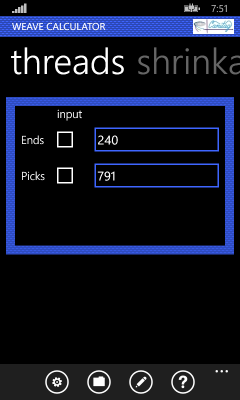 Weave Calculator 1.1 runs on Windows Phone 8.1 and later versions of Windows Phone supporting backward compatibility with Windows Phone 8.1. Weave Calculator Windows 1.1 is a standard Metro style application. The top of the screen has a banner identifying the product (Weave Calculator), the CD-spooling-out-yarn Canitag logo identifying it as one of my yarn/fiber related applications, and the page name or mode. For all pages except the main, the page name area holds the name of the page. For example, when you first start Weave Calculator, you'll be shown the sett pane. Both ends per inch (or centimeter) and picks per inch (or centimeter) will be checked because typically weavers have an idea of what sett is likely to yield a fabric of the desired drape. The default for Weave Calculator is to mark these as inputs from the weaver. The image that follows shows what the ends per inch value looks like when you're expected to supply the value and the picks per inch value looks like when Weave Calculator is supplying the value. By default, Weave Calculator assumes you'll want it to compute the number of ends (warp threads) and picks (weft threads) based on information such as the target width, target length, and sett. You can uncheck both ends and picks per inch on the sett pane and use the threads pane to fill in these counts if you prefer. If you swipe right to left along the pane name area, you will see the width pane. The ordering of panes is based on the anticipation that most weavers will want to enter sett, width, and length. 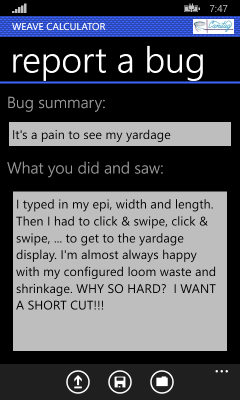 If you've just reloaded an old project, you can swipe left to right to see the yardage pane instead. The image that follows shows what the width pane looks like when you are expected to enter the width on the loom and Weave Calculator is supposed to compute the finished width. Pages that contain material that might flow beyond the end of the screen can be scrolled. 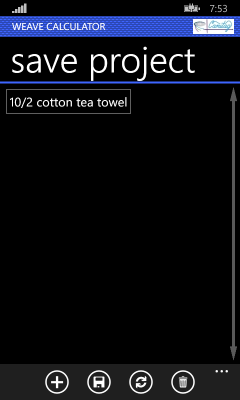 Weave Calculator shows a faded arrow on the righthand edge of areas containing scrollable content even if all of the content happens to fit on screen. You can swipe or drag in the direction of the arrow to get the content to scroll. Every page (screen) has an application bar. If you are holding the phone narrow end up, application bar will be found at the bottom of the page. If you hold your phone wide side up, the application bar will be found on either the right or left edge of the phone. The application bar always has at least an ellipsis (...). Some pages also have icons in the application bar. If you tap on the ellipsis, the application bar will grow to show you the labels for the icons and any additional commands that are anticipated to be used less often. Tapping on an icon or one of the additional commands will carry out some action applicable to the page. The main page has an application bar with four icons and four additional commands. 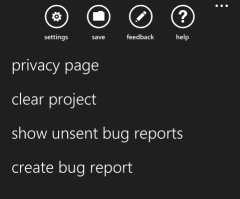 The two bug reporting options are also present in all of the other non-bug-reporting pages. The settings page has two sections. The first section lets you indicate your preference for working in inches or centimeters. You'll find a line listing different units for length (e.g. inch or centimeter). Tap on the unit you want to use when describing the width and length of your project. The selected unit will be shown in your accent color instead of your usual text color. For example, if you want to say that your project is 2.5 feet width by 8 feet long, select foot. 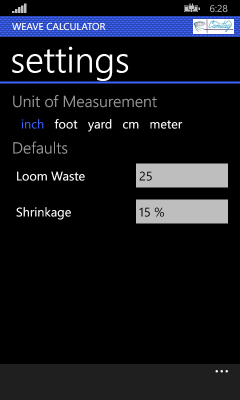 When you ask for measurements in inches, feet, or yards, Weave Calculator will use sett values that are per inch and yarn usage in yards. When you ask for measurements in centimeters or meters, Weave Calculator will use sett values that are per centimeter and yarn usage in meters. The second section let you supply defaults for the kinds of projects you typically weave. You can replace the default 25 inches of loom waste and 15% shrinkage with values typical of your (primary) loom and type of yarn. If you change these values, the new defaults will go into effect the next time you clear out project information (something you can do from the main page) or you enter Weave Calculator afresh. Changing the values won't tamper with what is on your main page right now. Weave Calculator 1.1 no longer provides a third section allowing you to opt out of advertisements and diagnostics. Weave Calculator 1.1 does not display advertisements ever. Diagnostic information is only sent when you explicitly grant permission. You can see and edit the emails containing diagnostic data to ensure that information you consider private is not sent. However, the more you edit out, the more likely that the misbehavior affecting you will not be diagnosed or fixed. Weave Calculator calculates as many of the statistics you have marked as outputs as it can, given which values marked as inputs have been filled in. Weave Calculator starts up showing the pane (pivot) prompting you to supply how many ends and picks per inch (or centimeter) you want to use. Fill in values that will yield the desired drape of fabric based on what you know of the yarn you plan to use, your experience, and any sampling you've done. 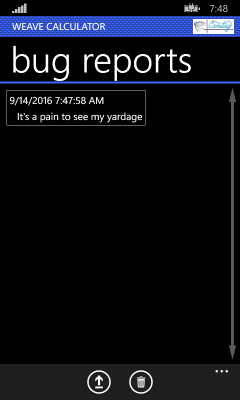 Now swipe along the line with pane names to bring each of the other panes (pivots) into view. If you see a value checked and you don't want to supply a value, uncheck it. If you see a value that you want to enter and it isn't already checked, tap the checkbox to check it. The pane to the right of sett is the width pane. By default, the width pane will prompt you for the width of your project on the loom and (once enough is known) will report back the finished width. If you have a particular finished width in mind, uncheck the box for the width on the loom, check the box for the finished width, and enter the value. Continue on to the right and you'll encounter the threads pane. Weave Calculator 1.1 assumes that the number of warp and weft threads is something you'll want it to calculate. The pane to the right of threads is shrinkage. The shrinkage is normally an input, but its value is initially set to a default. You can change the default for future calculations via the settings page. Weave Calculator starts off with a common value for how much both warp and weft will shrink when you take your weaving off the loom. If you know something about how you will weave or about your warp and weft yarns that make you expect that the warp and weft will behave differently, uncheck the common shrinkage checkbox and check the individual warp and weft checkboxes. Fill in your estimates. One thing that Weave Calculator 1.1 does not do is warn you when you've specified an incompatible set of inputs. For example, if you specify that your project uses a sett of 12 ends per inch and 12 picks per inch, has a shrinkage of 18%, a finished width of 48 inches, a finished length of 5 yards, and uses 1 yard of yarn, Weave Calculator will not warn you that 1 yard of yarn is insufficient. So don't supply values unless you're sure they are feasible when combined with all of the other values you are providing. Weave Calculator lets you save your work and read it back at a later. 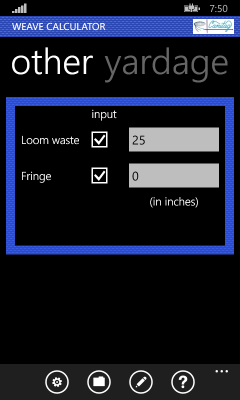 In Weave Calculator 1.0, saving and restoring projects only worked if you opted in to advertising. Weave Calculator 1.1 has no advertising so save and restore functionality always works. To save your data for a new project, click on the add icon to create an entry for your project. A dialog like the one shown below will pop up. Enter some text to identify the project whose calculations you are saving, then click the Create button. After you click the create button, you'll see a new entry in the list of previously saved data projects. You can come back at any time to the save project page and reload the data from a previous save. The data is kept until you use the save project page to delete it (or until you wipe all data on your phone). The list of your saves is shown in main portion of the saved data page. To load or delete a save, first tap it to select it. The text of the item you select will turn into your accent color. If you click the Sync icon, the data will be loaded into the main page and you will be automatically sent back to the main page. If you click the Delete button, you'll be given a chance to confirm that you do want to delete the save. If you confirm, the data will be deleted. To update data for an existing project, first use the save project page to sync to the previously saved data for your project (i.e. click on the Sync icon). Use the main page of Weave Calculator to make the changes you desire. Then go back to the save project page. You'll see that the entry for your current project is shown in the theme color instead of the usual text color. That means that your current project has already been selected. So you can just click on the Save icon. 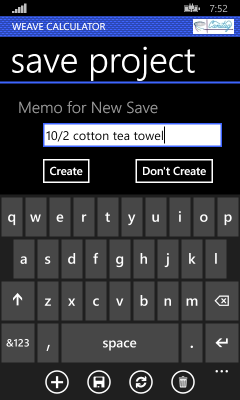 You can overwrite the data for any save by first tapping on the memo for that project then clicking on the save icon. Weave Calculator version 1.1 supports creating bug reports that you can either manually send in or delete. If Weave Calculator crashes, it will automatically attempt to log a bug report for the crash on your phone but will not automatically upload it anywhere. In addition, Weave Calculator version 1.1 provides a page that enables you to create a bug report whenever you choose. Please use the create bug report feature only to report once on each feature that confuses you or that you feel is not working properly. Weave Calculator 1.1 logs your most recent actions in memory. When you exit Weave Calculator, this log goes away. When a bug report is created, the log of recent actions along with information about your phone's manufacturer and model plus all software versions is added to the bug report. This information is intended to help me figure out the conditions under which the bug happens. I promise that I'll only use it for the purpose of figuring out how to fix bugs in Weave Calculator and improve the experience of its users. Weave Calculator does not save data about your activity except in bug reports on your phone. Weave Calculator only sends bug reports off your phone when you tell it to send a bug report. The first field is a short description of the bug. It will appear in the listing of bug reports logged on your phone and in the subject of the email reporting the bug to me (if you choose to send such an email). Don't try to describe everything that went wrong. Just give enough to give me a general idea of the kind of problem. Don't bother filing bugs that fail to describe what you experienced that seemed wrong. Complaints like It didn't work are not useful. What is it? What did you see that you wouldn't have seen if it had worked? What did you fail to see that you would've seen if it had worked? The second field is for a longer description of what you find confusing or think is incorrect behavior. It is helpful if you also add what you remember doing that led to the bug. The purpose of this is to tell me what to do to get the bug to happen on my phone. Anything you remember doing that was different from what you've done in the past without trouble is extra helpful. Weave Calculator supplements the details you remember with details it holds in memory (not storage) so please don't get stressed out with worry that you might forget something. The list of bug reports includes both those you create and those Weave Calculator creates when it is crashing. If you click the Now dialog button, Weave Calculator will send you to its page listing pending bug reports. You can choose to individually delete or upload each of the pending bug reports. If you click the Never dialog button, Weave Calculator will delete all pending bug reports. You won't be reminded about any of them again. If you see the dialog again, it will be because new bug reports have been created. If you click the Later dialog button, the dialog will be dismissed. You can use Weave Calculator normally. If you exit Weave Calculator entirely without deleting all of the pending bug reports and start Weave Calculator afresh later, you'll see the dialog again.